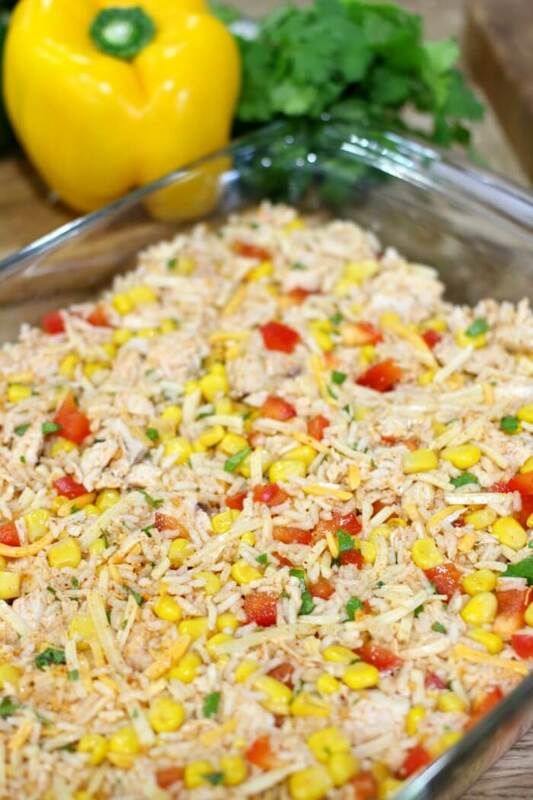 Chicken Taco Casserole is an easy to make chicken, rice, and vegetable casserole with a Mexican flare. Inspired by our basic cheesy chicken and rice casserole, this taco version takes it a step farther! 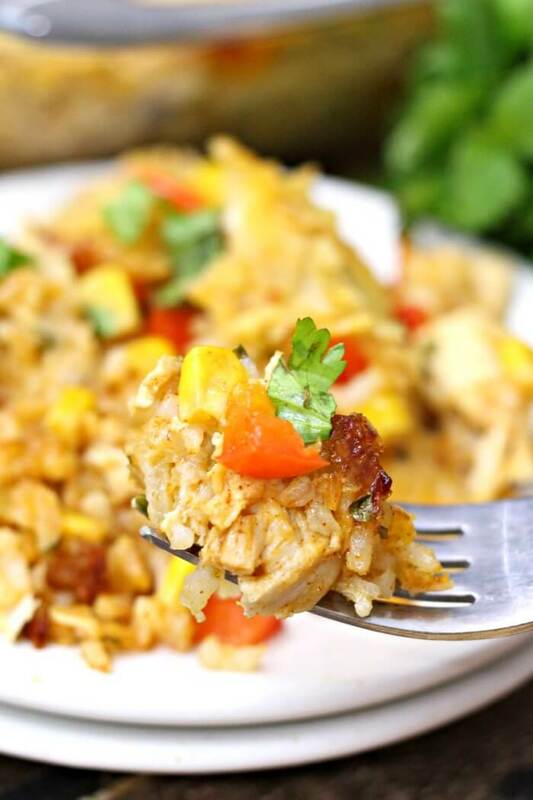 Chicken Taco Casserole has been declared the new favorite casserole recipe in our home! 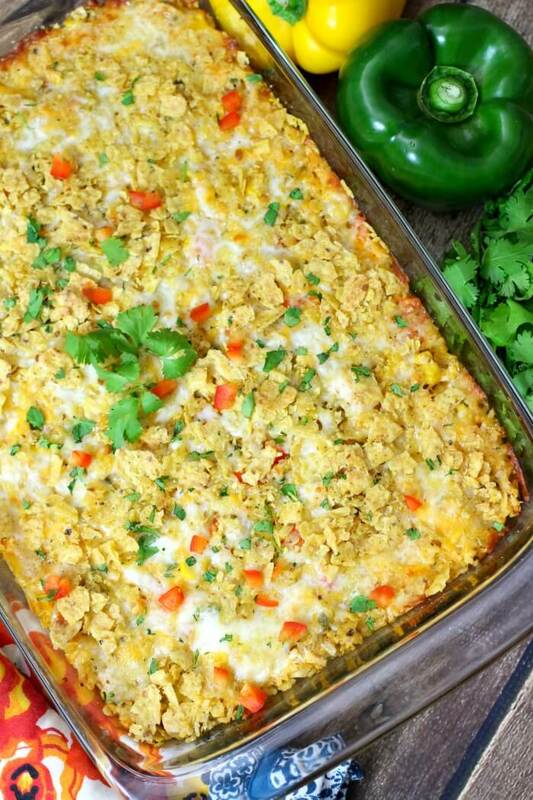 This ridiculously simple Mexican inspired casserole was flavorful and gobbled up by the whole family. 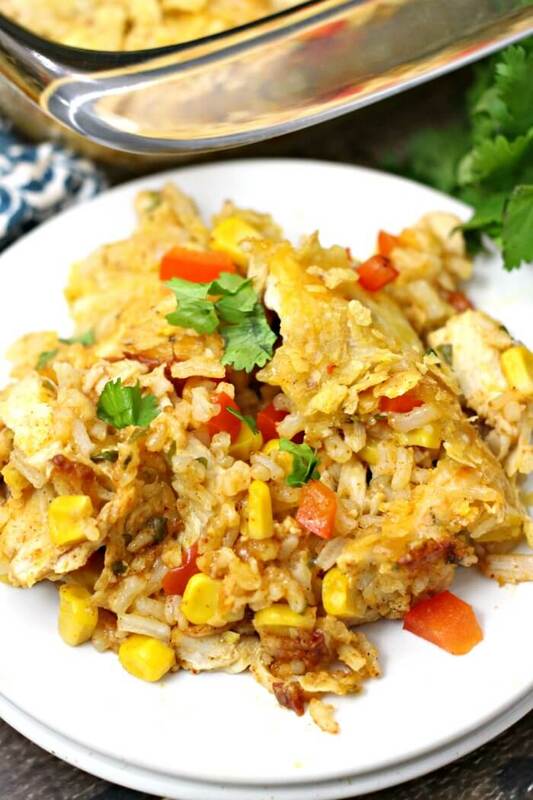 You will not believe how quickly it comes together – no need to even pre-cook the rice! 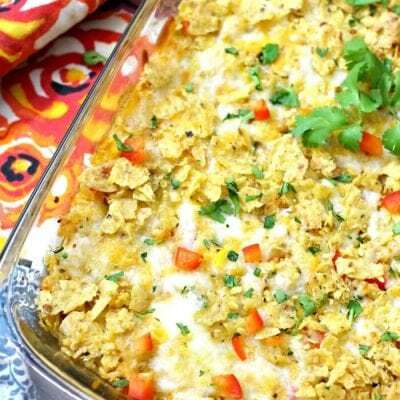 If you don’t like the fiesta flare, go ahead and skip the taco seasoning, you’ll have a (still delicious) basic cheesy chicken casserole! 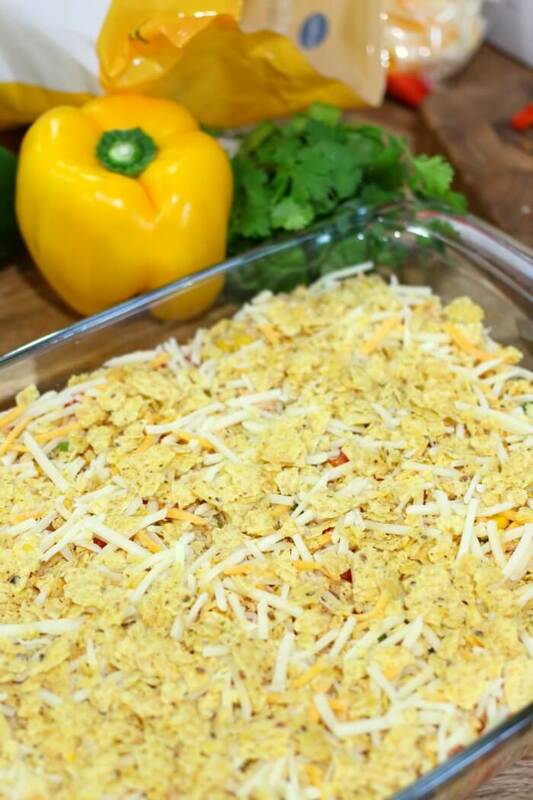 Our Taco Casserole recipe is made with chicken breast meat, sweet bell peppers (I chose red for a dash of color, but whatever you have on hand would work! 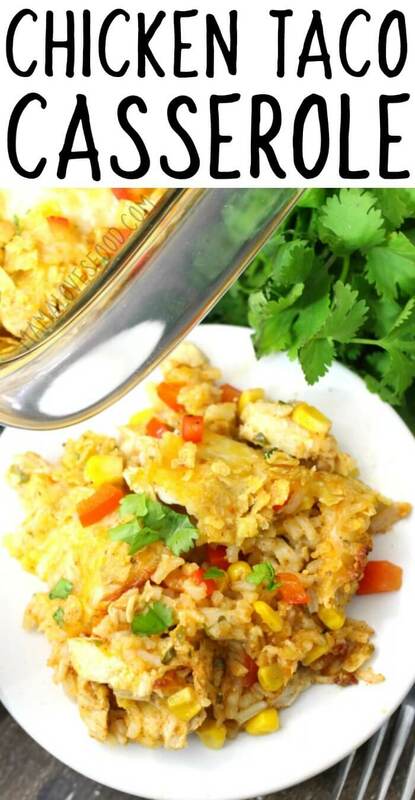 ), sweet corn kernels, rice, Mexican blend cheese and cilantro! I like to top it off with some broken taco shells or yellow tortilla chips as well for some crunch. 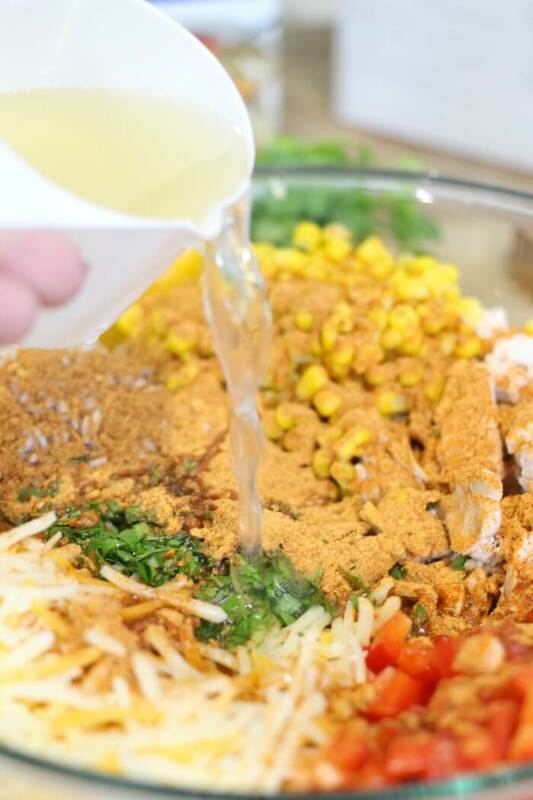 We use chicken broth in lieu of water for cooking the rice (it cooks IN the casserole! ), I love using chicken broth because it adds so much more flavor to the dish! College Inn crafts a deeper, richer broth; because every detail matters. They carefully select the finest, all-natural chicken and farm-grown vegetables. College Inn purposely blends the most flavorful herbs and spices and then finishes with a long, slow simmer. The savory taste is the detail that helps you make any dish and every meal delicious. 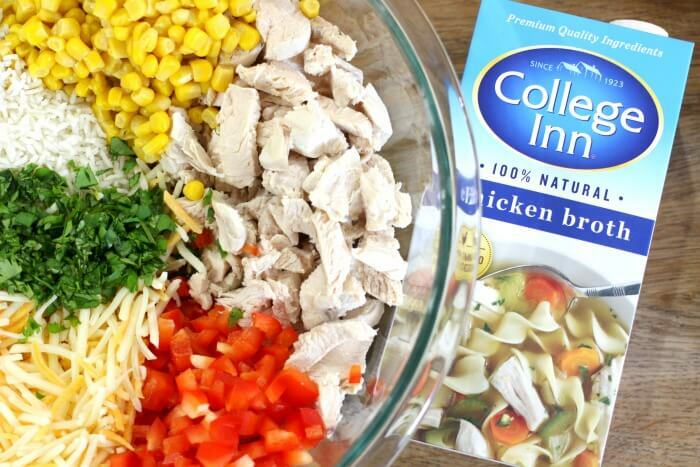 With College Inn, delicious is in the details! I love fresh cilantro in this dish, but if you can’t find it fresh, dried will work too. And if you’re one of the folks who thinks cilantro tastes like soap, then just skip it altogether. If you’d still like a pop of green, a little fresh parsley would work great. As for the corn, we like to grab a can of sweet corn kernels because it’s so easy – but you could use fresh or frozen as well. You’ll want to bring the frozen to room temperature or cook the casserole a little bit longer to compensate for the temperature though. And if you’re making this around the holidays, go ahead and use some leftover Thanksgiving or Christmas turkey instead of the chicken! It’s important to cover the taco casserole dish tightly with foil when you put it in the oven because you want the chicken broth to bubble and steam up in the dish so it cooks the rice until it’s soft. If you leave it uncovered you risk the broth evaporating and you’ll end up with crunchy undercooked rice. We like to remove the foil at the end and turn the broiler on for 2 – 3 minutes (watching closely! ), so the tortilla chips on top get browned and crispy. My husband likes to top his casserole with a little bit of sour cream, but the kids and I like it just as it is. 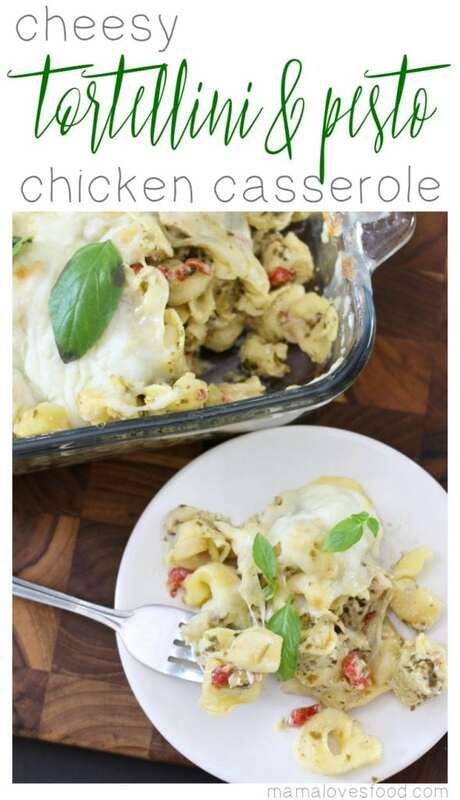 If love easy casserole recipes, make sure to check out these dinner ideas from Mama Loves Food! Hot Chicken Salad – I grew up eating Hot Chicken Salad, and now my kids are too! I highly suggest serving it with Cranberry Sauce. Yum! Chili Dog Casserole – This Chili Dog Casserole is a fan favorite on game day – don’t worry if the buns get soaked with chili and cheese, that’s the whole point! 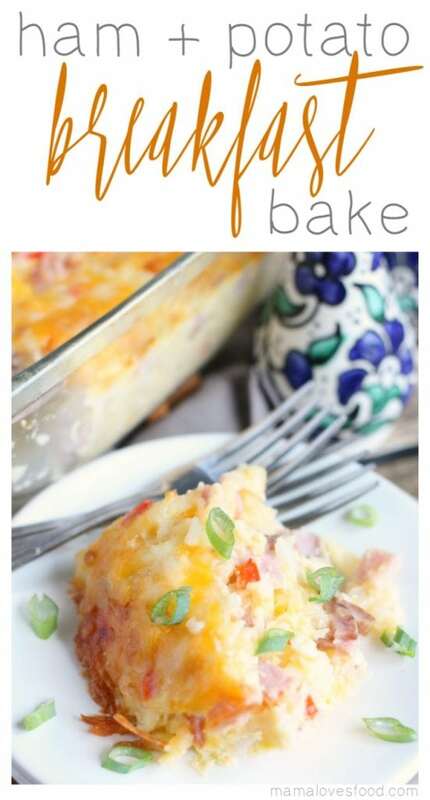 Ham and Potato Breakfast Casserole – What to do with all that leftover holiday ham? 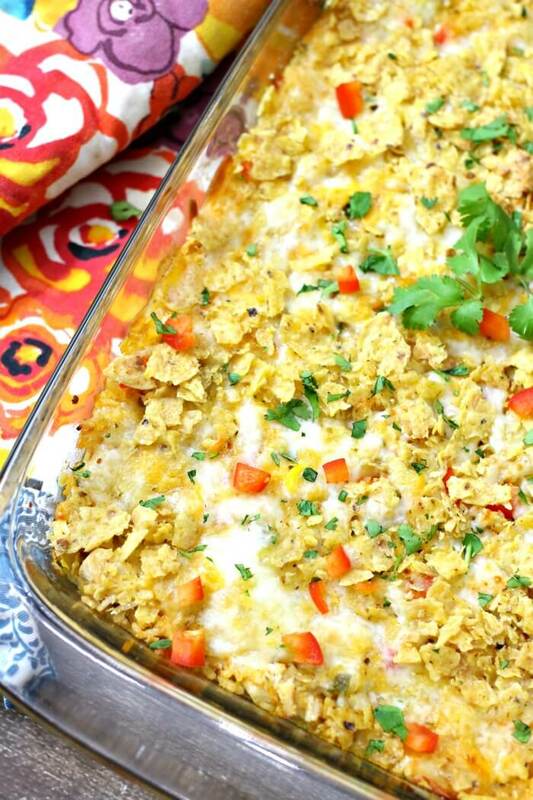 This casserole will have you wishing the holidays were even more frequent! Tortellini and Pesto Casserole – A little Mediterranean flare in this Tortellini and Pesto Casserole is the perfect way to brighten up a mid week meal. Broccoli Potato Casserole – Just call me basic with this Broccoli Potato Casserole. Basically delicious, that is! Thanksgiving Leftovers Casserole – I can’t be the only one who loves the Thanksgiving leftovers even more than the day-of meal? I literally have dreams about this Thanksgiving Leftovers Casserole! 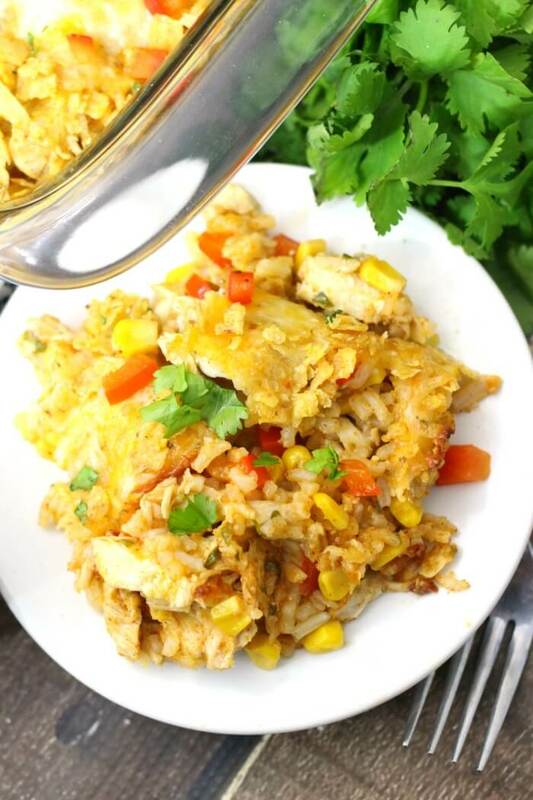 Loaded Cauliflower Casserole – We like to add some chicken breast to this Loaded Cauliflower Casserole and call it a whole meal. Don’t love cauliflower, try it with broccoli instead! 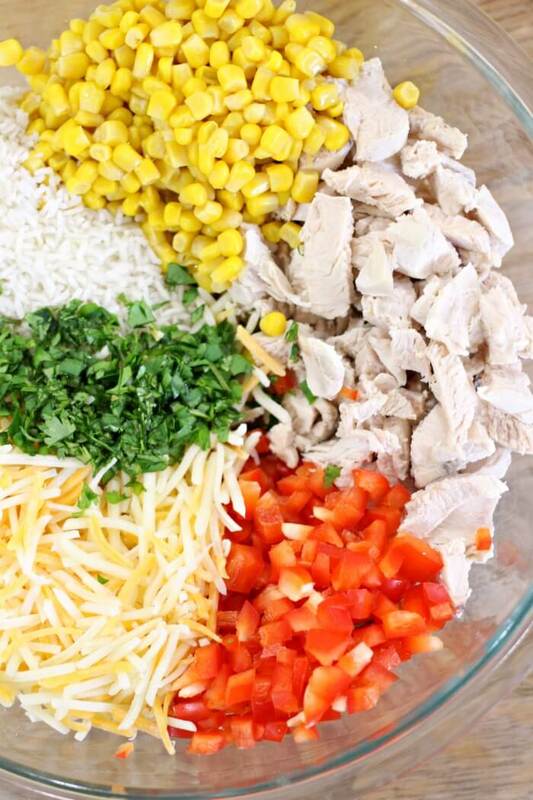 This easy Chicken Taco Casserole recipe is the perfect simple dinner idea for your family! In a large bowl, combine all ingredients except tortilla chips and 1 cup reserved shredded cheese. Mix well, then press into a 9x13 casserole dish. Top with remaining shredded cheese, then tortilla chips. Cover tightly and bake at 375 degrees for 30 - 40 minutes. Remove foil and broil on center rack for 2 - 3 minutes (watching closely) until chips are lightly browned. Mix well, then press into a 9×13 casserole dish. Cover tightly and bake at 375 degrees for 30 – 40 minutes. Remove foil and broil on center rack for 2 – 3 minutes (watching closely) until chips are lightly browned. 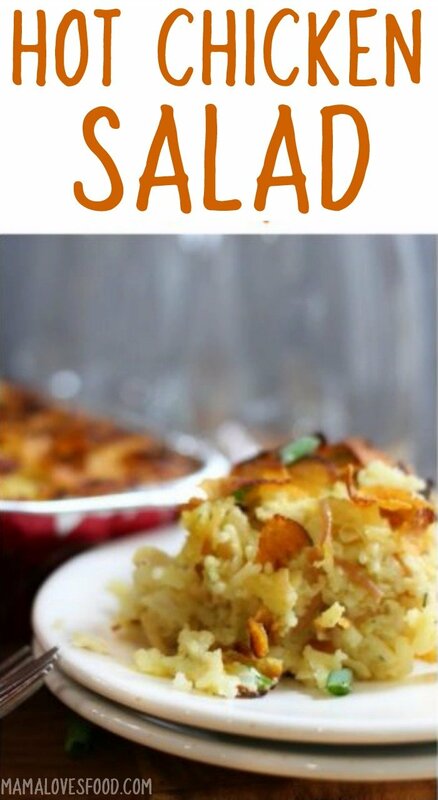 I can tell that this casserole would become a favorite around our house too!! I love how easy it is! This sounds like the perfect comfort food! I love making casseroles!